In a bowl combine honey, warm water & oil mix well; Sprinkle yeast and let it stand on the counter for 10minutes. In the mixer/ blender jar add mint leaves and garlic and blend it to the paste. 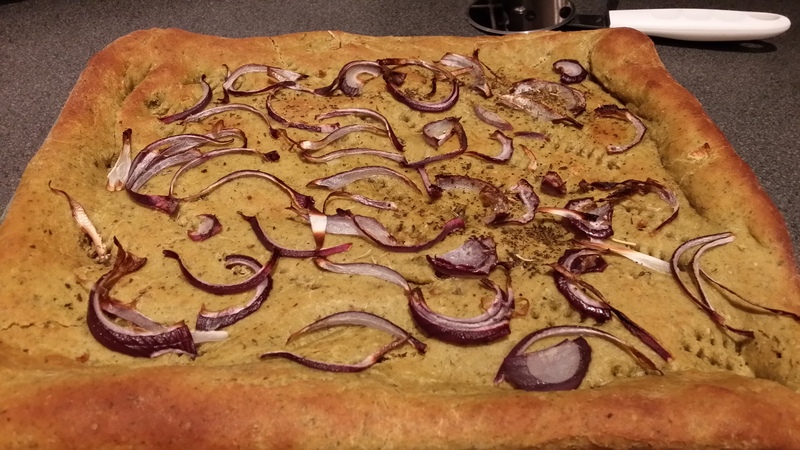 Add mint garlic paste & yeast mixture; Mix all together to form the dough (Add in warm water if required). Grease the bowl with 1tbsp oil in a bowl and set the dough in it. Wrap it with the kitchen towel / cling film and rest it in the warm place for 1-2hours or until doubled in size. Meanwhile flour the surface and spread the dough into desired shape and once the oven is pre-heated –pull the tray and shift the dough on to the tray and let it stand in the oven for 12-15minutes. Then brush it up with oil and top it with onion slices and herbs and bake it for 10-12minutes at 220deg. Posted on April 4, 2014, in Appetizers, International, Main Course and tagged baking, drchdietfood, flat bread, Garlic, Mint. Bookmark the permalink. 1 Comment. Reblogged this on Chitra's Healthy Kitchen.